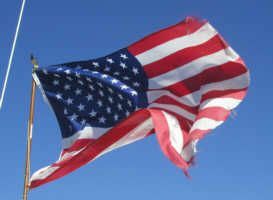 This year's America Project was necessarily short on planning and preparation. For two years the project has had a provisional approval until the park studies the legal and archeological ramifications of the project. This has meant that we get approval for our work late in the season and only for a subset of the work that needs to be done. 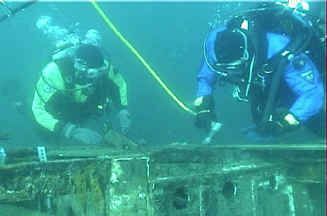 Unfortunately the degradation of the upper boat deck has continued to the point now that it will be very difficult to prevent it from collapsing. We lost the large spindled support posts on the open after deck over last winter. It is largely up to Mother Nature at this point. A significant storm could easily agitate the deck enough to destroy it. We will continue to try to shore it up, but we may soon have to re-trench and focus on preserving the next deck level. 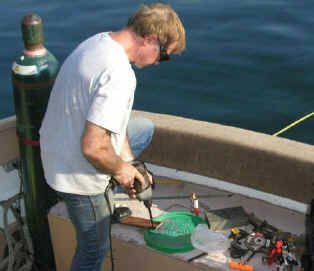 This year we continued the cabin deck repairs we started last year – replacing the cabin deck over the Engineers Quarters and refastening the main aft deck support whose fastening bolts had been sheared by the movement of the deck. See the list of tasks completed below for the complete list of our accomplishments. 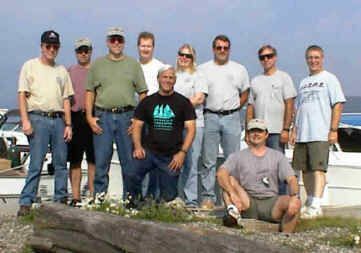 The work was done using two boats the Heyboy, and RLT Diver III and ten participants Brian Anderson, Kris Thompson, Steve Daniel, Ron Johnson, Ken Knutson, Phil Kerber, Paul Imsland, Bob Nelson, Bob Olson, and Ken Merryman. 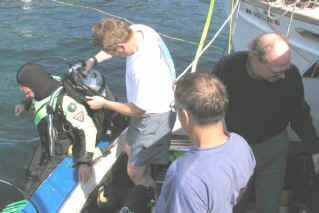 Our thanks to all of the participants and a special thanks Brian and Kris for making the RLT Diver III available. The focus of this year’s effort was to continue trying to save the Boat Deck and Cabin Decks from collapsing and falling over to the port side. Each year parts of these two decks move inches to the port and more supports break or come loose. The cable and beam we installed to temporarily slow the process is helping, but it is bending from the strain. After inspecting the aft deck support arch we discovered that the decking had not sheered from the support as we had guessed. The support beam had separated from the vertical arch leg. Unlike the support beams forward which are made of steel, the aft beam is oak and the steel bolts that fastened it to the vertical steel support had sheered. The beam and deck had shifted to port about six inches. We tried to pull the beam back into position, but that proved to be impossible with the tools that we had, so we drilled new holes and re-bolted the beam where it was. We turned lifeboat davits together toward center of the ship to help alleviate strain they put on the cabin and boat decks. They were hanging out over the side and at the angle of the ship they were a very heavy weight trying to pull the deck to the port side. We tried this two years ago but didn’t get them to stay in place. 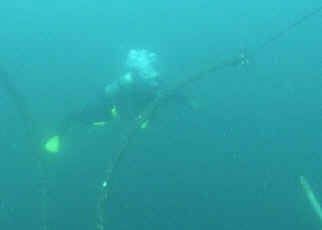 This year we chained the two forward davits together to get them to stay. We were unable to drill into the base of the aft davit to pin it so we just pivoted it toward the center, but we suspect it will eventually fall back. 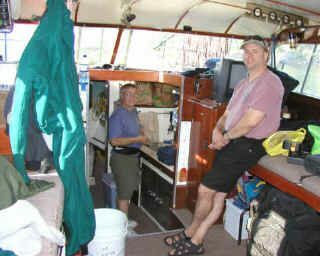 Time did not allow us to add the oak cross support to back wall of cabin deck that divides cabins from open after-deck. That wall is the only athwart ship wall on that deck and is the main support of the boat deck. Unfortunately it has broken at the doorway and is now shifting and allowing the boat deck to move to port. We found and replaced the cabin deck section that was the roof over the engineer’s quarters. 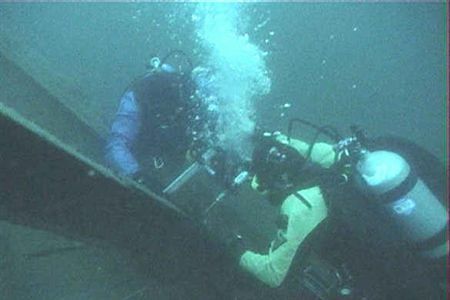 The missing section was wedged under another broken section of the boat deck. The heavy boat deck section had slid over since spring so we had to lift it off and set it on the bottom. We believe moving the loose boat deck section off the cabin deck will also help alleviate the strain on the cabin walls of the cabin deck. 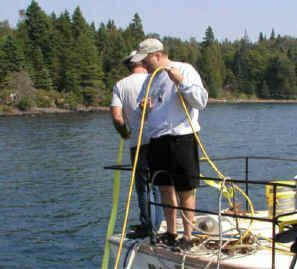 We fixed the mooring. The park mooring block was upside-down. With our medium lift bag it was quick work to flip it over again. We re-hung the fallen sprinkler pipe over the truck to alleviate an entanglement. We could only find two of our Monitor Points to re-measure. We believe the others disappeared in the deteriorating afterdeck. 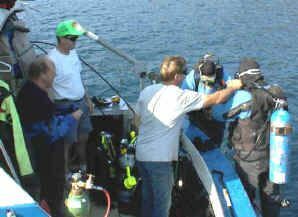 The Back Deck of the RLT Diver III was always a busy place for staging the dives. Working in two teams let us work on two construction areas simultaneously. The Heyboy was the power pack running compressors, and generators almost continuously. Required building materials are fashioned as required by Ken Knutson. Some of the motley but dedicated crew. 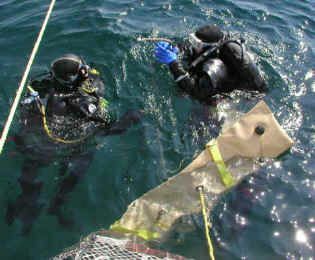 With our medium size lift bag, it was quick work to reposition the park mooring block for them. Ken Merryman pushes davit from below while a crew on the boat pulls on a line to spin it into position. Steve Daniel and Bob Nelson attach new deck piece to engineers cabin. Bob Olson and Brian Anderson drill a vertical support beam to install a reinforcing plate.